Hey there music fans. We’ve got some great news. There’s a new product range from Roland. They’re electronic. They’re intuitive. And, they’re darn cool. Now might be the right time to overhaul your band’s sound, once and for all. Hello, band pals. I’ve got news for you. It might be time to let loose your keyboard players. 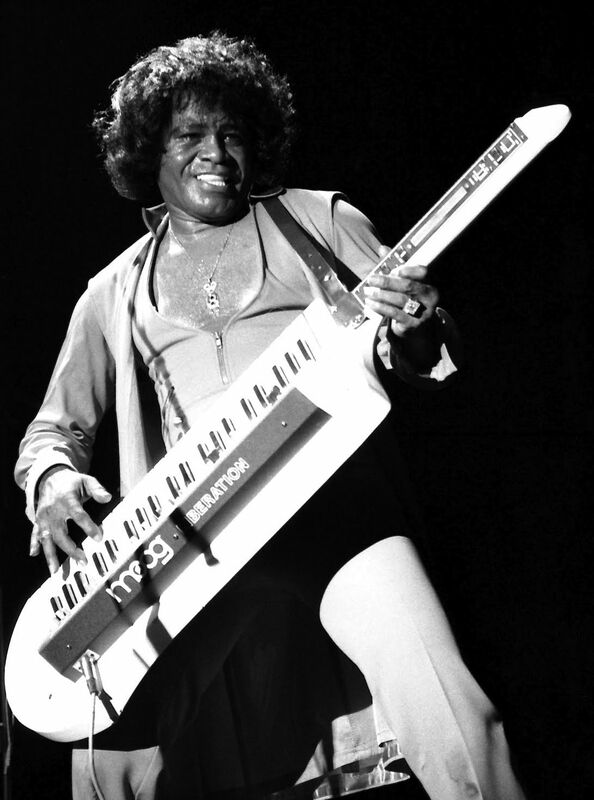 Because, Roland has just announced the return of the keytar. I know what you’re thinking. “Are you sure this is a good idea?” Well, James Brown thought so. And, if it was good enough for the Godfather of Soul then surely it’s good for you, too! Ok, let’s break it down. As an artist you want to connect with your fans. They want a performance that stands out. And, your keyboardists craves their moment in the spotlight. Everything is pointing towards the Ax-Edge Keytar. It features a sleek and modern design with a customizable look. It’s got 49 keys and a set of sounds specific to keytarists. The AX-Edge also features thoughtful design features and gives you the freedom to confidently express yourself on stage. So, say goodbye to the that rickety old keyboard stand. And, say hello to your new show stopping keytarist. So, you want to be a drummer. You’ve seen everyone else do it and you think you’d like to give it a bash. But, it does looks REALLY hard. Maybe you’re thinking that you might be suited something else. Well, drummer buddy. I’ve got some advice – don’t worry about it. Because, the TD-1DMK is a hassle-free kit that’s easy to set up and use. More than that, it will even teach you how to play the darn things. It features a choice of 15 authentic preset kits that sound accurate enough to deliver a realistic drumming experience. And, if you need to start working on your technique or timing then you can use its on-board coaching functions. You’ll be beating away in no time at all! And, not only does the TD-1DMK help you learn the drums, they’re quieter too. This is down to the durable dual-ply mesh heads that absorb the impact of the beater. This means you and your mates can jam all night without bothering your neighbour. You know the scene: you buy a new keyboard. Then, you plug it in and spend hours reading the manual. For an age it sounds rubbish and you wish you’d stuck to drums. After you’ve finally mastered the presets you play a gig. But, the keyboard is so heavy you need a mule for transport. It all sounds like a total disaster, right? Now, ditch that manual and look at the Roland JUNO-DS76 Synthesizer. It’s an intuitive keyboard that features several pro-quality sounds including piano, organ and synth. Simply plug it into your amp or PA and off you go. And, it’s really easy to create your own signature sounds, too. For example, you could layer strings onto an acoustic piano. Or, assign an organ to your right hand and bass to your left. Furthermore, the DS76 is pretty light. You’ll have no problems carrying it on your back, loading in or setting it up. And, when you’ve had enough of your new custom sound, just download some more. Overall, the JUNO-DS76 is an excellent piece of equipment. And, that concludes our look into the new product range from Roland. Pop into Rich Tone in Sheffield and talk to our staff about more great products we have available.